Your gutters are one of the most critical components of your home. They are designed to protect your home from flooding, roof damage, landscape erosion, foundation damage, mold, a heaving driveway, and more. At Higher Ground Rainwater Systems of Asheville we offer three types of gutters, as well as copper and decorative work, so that we can protect your home from rainwater damage while preserving your personal style. 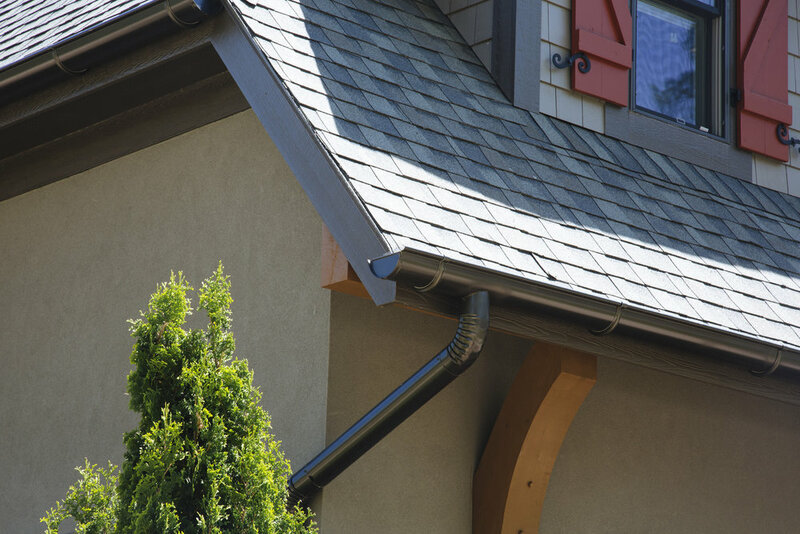 At Higher Ground Rainwater Systems of Asheville, we guarantee professionally-installed, seamless gutters that are pressed on-site at your home to ensure quality and eliminate leakage from seams. Our professionals are the best in the business and can ensure that your new gutters will not hold standing water or leak, and that they are securely fastened to the fascia of your home. We will ensure that our installed downspouts are securely fastened to the exterior of the house and that the runoff will tie in properly to your drainage system. Altogether this will keep your home running like a well-oiled machine, keeping rainwater from damaging your home and creating the need for costly repairs. Click below to learn more about our gutter installation services. There are many advantages to having a metal roof; however, unlike shingle roofs, metal roofs have smooth surfaces that do not provide any resistance to keep snow from sliding off. In this case, snow build-up can suddenly break loose in a massive slide that can cause damage to gutters, patio furniture, air conditioner compressors, vehicles, or in some cases even cause bodily harm. If you have a metal roof, snow breaks are a must-have! The type of snow brake our estimator will recommend depends on the type of metal roofing installed on your home. Snow brakes are installed in a specific quantity and in a pattern based on the shape, size and pitch of your roof, in order to provide the most uniform system of snow retention possible. All of our snow guards are tested extensively in the field by roofing experts. Click below to learn more about our snow brake installation services.